For your dream day the only limit is your imagination! With an Independent Celebrant you can have whatever you wish! I’m here to help you devise a beautiful, inspiring, Wedding, Civil Partnership, Blessing or Committment ceremony, unique and personal to you, which will be a truly special day for you and your friends and family to remember. I am sensitive to different cultures and philosophies and will help you to create your own personal ceremony which is meaningful for you. Your ceremony may be quite traditional or you may want to create something entirely original. You may want special readings and rituals, candles, broom jumping, or breaking glass. 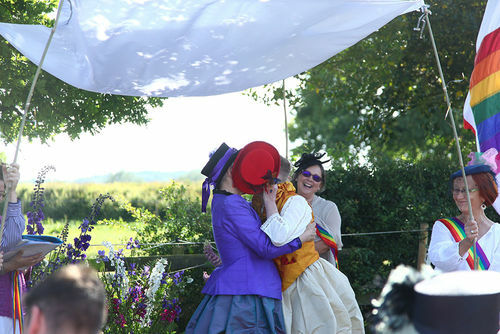 You may want a Handfasting Ceremony, either as a whole ceremony or as part of your wedding ceremony. You may want a non-religious ceremony, or you may want spiritual elements woven into the ceremony, it’s entirely up to you. And you will always have the final say on all aspects of your ceremony. You can choose the location of your choice, in a wood, on a beach, in a historic building, for example, whatever your wishes may be. 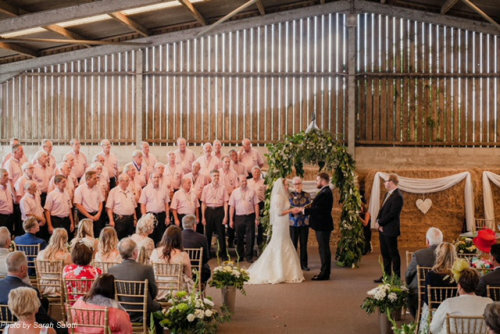 I will also work out the ‘choreography’ of your ceremony with you, which is how your chosen music, readings and other elements will work together smoothly. I will put together the Order of Service and can advise on where to have your readings & music. I can also offer information about obtaining your marriage or civil partnership license - this formal registration takes about 10 minutes in a registry office a day or two before or on the morning of the ceremony. I will offer you organised guidance throughout the entire process. I will spend time with you, listening to your wishes and hearing your stories to get a true sense of your personalities and what you want to say to the world about your relationship. I can be readily available to contact via email and phone to answer any questions or concerns that arise. You will need to book and pay for your venue and other requirements such as catering, music, photographer etc. This includes home visit, telephone contact with celebrant, draft ceremony for checking, order of ceremony agreed, friendly support, liaison with your venue, walk through prior to ceremony, professional delivery of service in venue of your choice, your own written copy of service. •	If you wish me to purchase items you want to keep after your ceremony, such as witness book, handfastings, candles, coloured sand, order of service being printed…and so on. •	If you want your ceremony to be held at a venue or time that incurs an overnight stay or much travelling we can agree costs. •	If you want your family or friends to sign their witnessing of your ceremony we can discuss whether you will want a parchment or witness book & either you or I can obtain this for your day. This will be an extra cost. As a member of the Fellowship of Professional Celebrants, I follow a Code of Ethics and Practise, and hold Public Liability Insurance.